· How do we make economic decisions? · How do we make cost/benefit analyses in our everyday decisions? · Small group activity to develop a definition for scarcity and to give a scenario that fits for a cost-benefit analysis. · Teacher conferencing with groups for validity of cost benefit analysis. · After student generated scenarios, the class will look at the idea of college acceptances and how the results of ED/EA and rolling admissions are reflected in the concept of scarcity. · Cost/benefit will be analyzed relative to the decision about where to apply to college. · How do we see opportunity costs in action when we make a decision? · How does utility factor into decision making? · Class discussion about the nature of decision making and how opportunity costs factor into the cost/benefit analysis. The issue of utility will be added later in the discussion. · Students will be asked to defend their opinions about the utility of certain economic options. This series illustrates how economic theories are implemented in a practical business environment. In this episode, the teams operate a franchise for the day and offer a new burger to the public. The team that earns the most profit from sales of their new burger will win. Answers must be In Your Own Words. 1. Watch appropriate episode of Apprentice online here. 2. Complete the Apprentice Worksheet. Your answers must be in complete sentences, paragraph format, and printed. 4. Apprentice Evaluation Sheets must be turned in before the next episode! · How have economies evolved over time? Class discussion about how economies have evolved from traditional to barter to monetary exchange. Small group discussion and scenario generation about the division of labor and the role of specialization on evolution of economies – teacher will conference with each group to guide scenario development. Historical basis of a laissez faire economic policies and how they impacted U.S. economic growth. 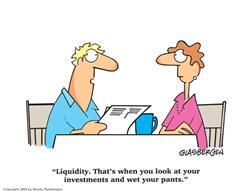 Remember: Post your Stock Portfolio results on the Blackboard Blog site by Monday! 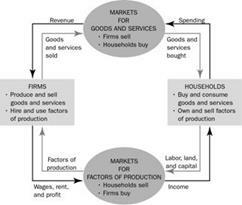 How can we use the circular flow diagram to understand economic booms and busts? How does knowledge of the circular flow help us to predict the economic impacts of certain decisions? Students will go to the board and create their own circular flows and answer questions about the circular flows from fellow students as well as teacher. 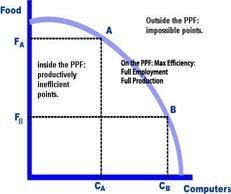 How does a Production Possibility Frontier (PPF) illustrate the concepts of opportunity cost? How are land, labor and capital reflected on the PPF? How does moving production on the PPF illustrate cost/benefit? Teacher directed creation of a PPF with student input on the elements of the economy being measured. Small group discussion about the PPF’s (at right). Students will go to the board and create their own PPFs and answer questions about the PPF from fellow students as well as teacher. This episode will illustrate how scarce resources lead to trade-offs and choices, and how those choices and limits can be represented through graphs and models. Be prepared to answer a short quiz based on the questions listed during the video, and discuss the answers. 1. Watch appropriate episode of the Apprentice online here. 2. Complete the Apprentice worksheet.Your answers must be in complete sentences, paragraph format, and printed. · How can a PPF explain the differences in approaches to economic production between capitalism and socialism? Split class into two groups: one looks up capitalism the other looks up socialism. Each group presents findings to the class. Students will create two formative PPFs – one that shows capitalism and one that shows socialism. Teacher led discussion about how the PPF can explain the differences in economic priorities between the two.